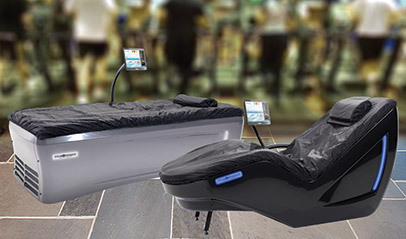 What are HydroMassage Water Massage Beds and Lounges? Or, the last time you used a shower massager on a sore, achy neck. If you suffer from back or neck pain and need some relief during the day, it’s usually not real practical to go sit in a hot tub or get a shower massage. But, what if you could get that same feeling everyday without getting wet or taking off your clothes? Welcome to the world of water massage Beds and Lounges. the drawbacks or inconveniences of getting wet or undressed. You lie down on top of the water massage bed fully clothed, and press start on the Touchscreen. A wave of water inside the bed starts travelling back and forth. You can direct the massage anywhere on your body (ex. your neck, your calves, lower back, etc). You also get to adjust the power of the massage (10 different levels), how fast it goes up and down the body, and the temperature of the water. It’s totally up to you to create your perfect massage. And, on top of that, you can also use the Entertainment features on the Touchscreen to listen to relaxing music, watch a movie, play games, read a book, or even surf the internet during your massage. Overall, water massage beds are a great way to relax, and it only takes about 10-15 minutes out of your day. So, if you’ve never experienced this technology, find one and go try it today. Most likely, there’s a chiropractor, physical therapist, spa, salon, or fitness center with one in your area. Click here to find a HydroMassage bed near you. Click below for a quick demonstration on HydroMassage. For more information on HydroMassage water massage beds, call 1-800-699-1008.
what makes it feel so amazing. Read about the history of water massage beds. water massage has improved their lives. Now it's time to experience a water massage first hand. Find one near you.